I was off with the Opening Night of The Tension Experience, which is such a mind-blowing, live, immersive experience, even one of the journalists covering it in its "prequel" aspect was freaking out. During my first night absence (the first of several weeks), tonight our guest was our own Kat Klockow, discussing her latest book Ohio's Haunted Crimes: An Exploration of Ten Haunted Crime Scenes. Except there was a substantial technical issue. Resourceful Kat began video broadcasting live on Facebook. People in the chat room didn't realize that when Facebook auto-plays a video, one has to Switch On the accompanying audio. Kat did a quick tour of her place, and began discussing the book, whilst Henry was working at getting Skype to work. About nineteen minutes in, he was able to get back onto Skype and dial in Kat, who continued the video, but the Facebook video did not pick up Henry's audio in Kat's headset. Henry managed to get started the show. Kat considered shutting off the video aspect, as the show was running, but comically decided to keep it running live; a pity on the video one can only hear Kat. 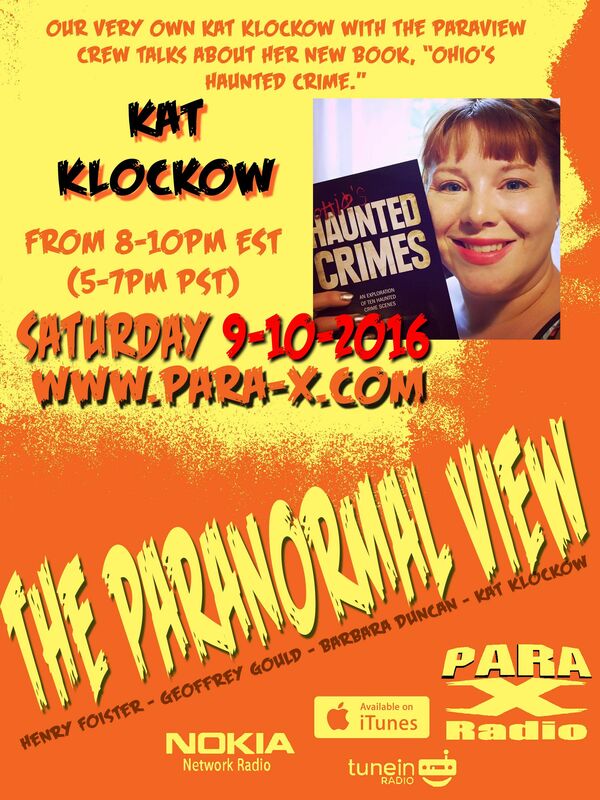 Author Kat Klockow on 10 September 2016 edition of The Paranormal View. Anti Spam Blocker : Helping Fight Spam Email!